SHARAN is proud to be associated with the Ahimsa Parmo Dharmo group’s endeavours to spread Ahimsa – the need of the hour. After the successful One Earth Festival, join us this time at The Ahimsa Festival in Kandivali. 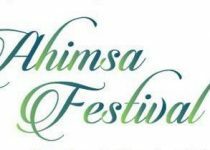 Expect to attend the Ahimsa Business conference for networking, hear experts speak, attend cooking demonstrations, take part in kids competitions and activities, learn about ideas to save the environment, the Ahimsa Bazaar and indulge in foods based upon compassion, along with music, fun and more! This is a free event, but registration is a must.